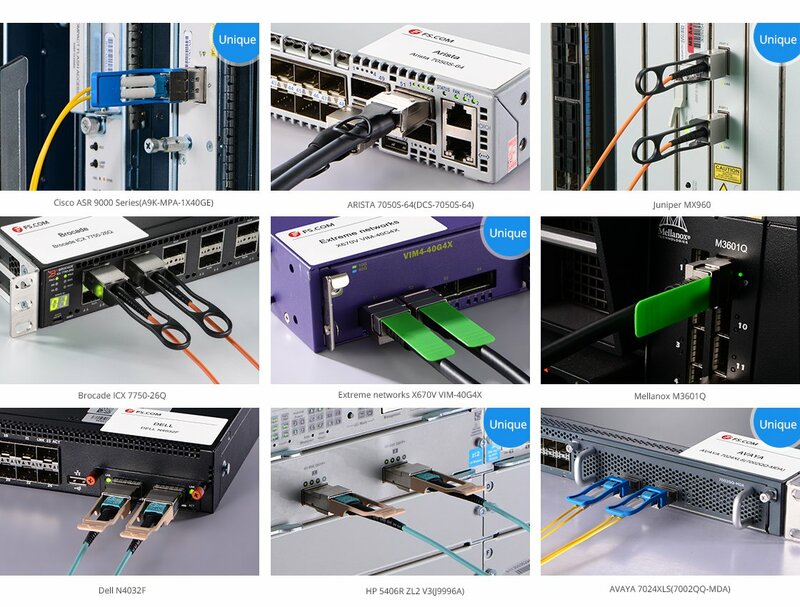 When interconnect Cisco 100G QSFP28 SR4 Optics transceivers for your ultra high speed networks in data center, the use of MTP MMF cabling is generally the preferred cabling method. 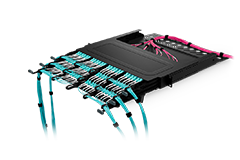 As shown in below interconnection, HD fiber enclosures are used to complete the interconnection. 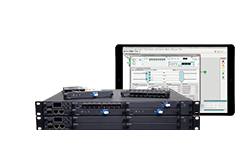 FS Test Bed has completely upgraded for now which set us apart from other third party products provider. 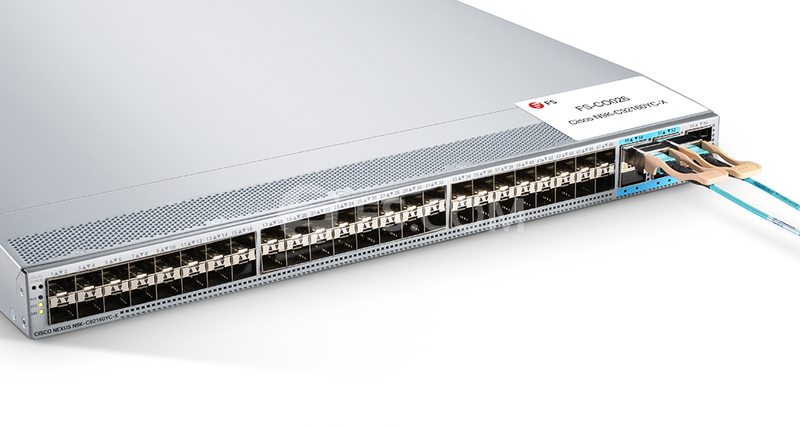 All of the 10G, 40G, 100G transceivers and direct attach cables have already passes through the test on the latest top-brand switches. The original switches marked “Unique” below could be found nowhere but at FS test center, eg: Juniper MX960 & EX 4300 series, Cisco Nexus 9396PX & Cisco ASR 9000 Series, HP 5900 Series & HP 5406R ZL2 V3(J9996A), Arista 7050S-64, Brocade ICX7750-26Q & ICX6610-48, Avaya VSP 7000 MDA 2, etc. 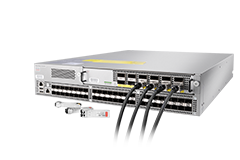 Cisco QSFP-100G-SR4-S is supported on a wide range of Cisco equipment. Les articles répondent à mon attente. J'ai acheté huit modules optiques. Chaque module fonctionne sans aucun problème. FS est notre partenaire fiable. I get the product very fast and it connects well. It matches well with my device. And the customer service reply to my question fast. I get the product quickly. Due to an urgent project, we needed 30pcs QSFP28 SR4 soon. Then I placed an order and the website showed it would be shipped from Seattle directly. I ordered F5 compatible parts, but I received Cisco parts. They explained the Cisco parts could replace the F5 parts. 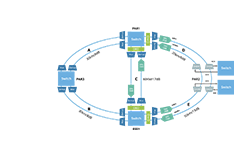 But based on the feedback from our engineers, we've met big problems when we connected Cisco parts with Juniper parts together before. It's an important project and we couldn't take the risk. So we required a replacement and they did a fast shipment. I love their service! 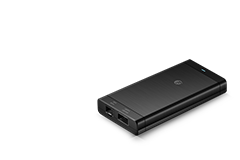 I really worried about third-party modules previously, especially for 100G modules. 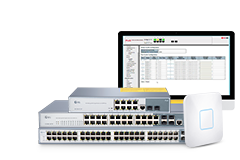 My sales Shirley shew me their 100G switch for testing and promised to send me test report before shipment. Then I tried. The test result is beyond my imagination and it works well on my Cisco switch. It's important to keep trying. You will find much good things. I'm a businessman from the United Kingdom. I began to place optical orders from Fiberstore several months ago, but sincerely I have to say that I love shopping at here. Last week, I added another 8pcs QSFP28-SR4-100G for my customer, and received them within 3 days with free shipping, also trust they will work well as previous. Hope more and more inventory would reach its European Warehouse. My friend recommended FS.COM to me before, so I placed a testing order. Everything goes well. Since then, I often make purchases from FS.COM and I have always had excellent customer service. 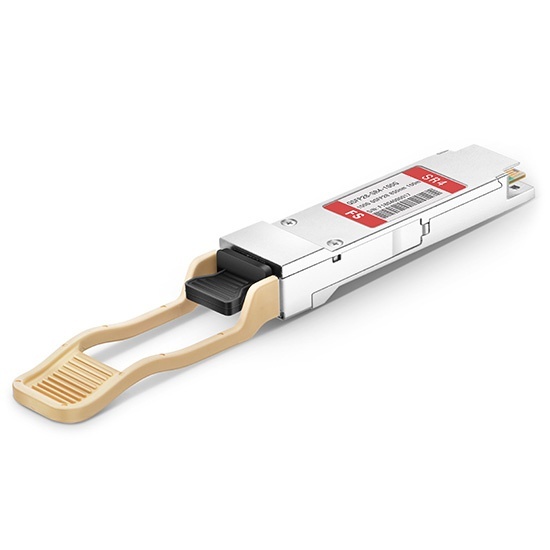 I would like to buy QSFP28-SR4-100G from FS.COM because it has better quality with low price. 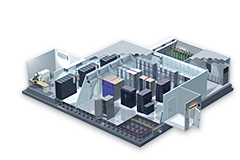 We were in the planning phase of a major 100G campus-wide upgrade. There is no doubt that I will use Fiberstore optics for those upgrades. I had bought many 40G optics from them. They worked well as always. And the price of 100G SR4 cut down, so I seized the chance to order all we need. As always, the packaging and shipping was very well done and everything is accounted for. Thank you. Your shipping team has done a good job on this order and I do appreciate the detail that is placed on shipping such a large and varying product base in a single shipment. 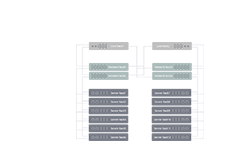 We had a large volume for 100G transceivers each month. FS 100G transceivers always had good performance. This time our Account Manager told me that it had a big price reduction, so we purchased some more which can be used for six months. Surprisingly, we received the goods quickly. That's great.